President Trump announced Wednesday that the U.S. views Jerusalem as the capital of Israel, a controversial move that complicates Middle East politics. Those Jews and evangelical Christians who say an undivided Jerusalem should be the eternal capital of Israel have a ready answer for anyone who questions that claim: The Bible says so. The most often-cited text is 2 Chronicles 6:5-6, wherein King Solomon quotes God as saying, "Since the day that I brought my people out of the land of Egypt, I chose no city in all the tribes of Israel in which to build a house, that my name might be there, and I chose no man as prince over my people Israel;but I have chosen Jerusalem that my name may be there and I have chosen David to be over my people Israel." The Bible could hardly be more clear, it would seem. "As far as God is concerned, Jerusalem has been the eternal, undivided capital since the reign of David," said Laurie Cardoza-Moore, whose television program, Focus on Israel, is aimed primarily at evangelical Christians like herself who see the Bible as "true and historically accurate." God, she said, "established the boundaries of all the nations, and he chose the city of Jerusalem for himself." That faith in the doctrine of biblical inerrancy and the Bible's dictates regarding Jerusalem is shared by many Zionist Jews, including the city's mayor, Nir Barkat. "Everywhere you put a shovel in the ground in Jerusalem, you will find Jewish roots and connecting to Bible stories," Barkat told NPR. Like other Israeli leaders, Barkat rejects U.N Security Resolution 242, which calls for the withdrawal of Israeli forces from territories occupied during the 1967 war. While those territories include East Jerusalem, the resolution does not list the territories or specifically say forces must be withdrawn from all of them. "Any U.N. resolution that dismisses the Bible and dismisses the history, in many, many ways is irrelevant," he said. "If you go back, even legally, [Jerusalem] was never anything but belonging to the Jewish people." Those Christians who are not themselves Jewish may still feel included among the "people" of Israel, Cardoza-Moore said, by virtue of their faith in Jesus. She quotes Galatians 3:29, where Paul says, "If you are Christ's, then you are Abraham's offspring." Her organization, Proclaiming Justice to the Nations, is dedicated to "building a global community of action and prayer in support of Jews and Israel." President Trump's decision to recognize Jerusalem as Israel's capital and move the U.S. Embassy, in Cardoza-Moore's judgment, is "spiritually, biblically and historically significant." Such sentiments, however, largely disregard the perspective of the many Muslim residents of Israel and the surrounding territories, for whom Jerusalem is also a holy city. Al-Aqsa Mosque in Jerusalem is the next most important site in Islam after Al-Masjid al-Haram in Mecca and Al-Masjid an-Nabawi in Medina, both in Saudi Arabia. The argument that Jerusalem should be the undivided capital of Israel is also rejected by many of the Christians who live there or in the neighboring territories. Most are ethnic Arabs, and they may feel less kinship with Jews. In a joint letter to Trump before he announced the policy change on Jerusalem, leaders of local Christian churches cautioned that it could bring "increased hatred, conflict, violence and suffering." 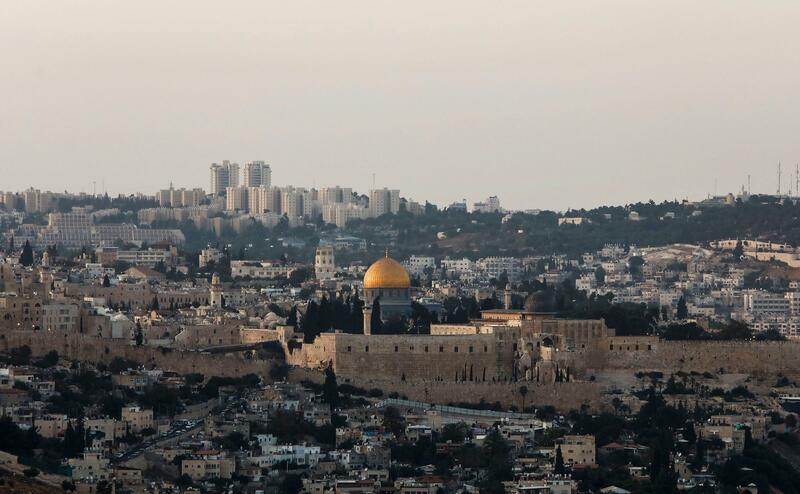 Some evangelical leaders in the United States who work closely with Arab Christians in Israel and the Palestinian territories also worry about the ramifications of the Jerusalem policy change. Travis Wussow, vice president for public policy at the Southern Baptist Convention's Ethics and Religious Liberty Commission, called Trump's declaration "important" but warned that many Arab Christians are "concerned" about it. "As the Middle East absorbs this news, let's pray for the peace of Jerusalem, pray for the safety and flourishing of our Arab brothers and sisters in Christ, and pray [for] our brothers and sisters in majority-Muslim contexts," he wrote. Among the U.S. evangelical leaders who disagreed with Trump's move was Gary Burge, a New Testament scholar at Calvin Theological Seminary in Michigan. "For many evangelicals, the modern state of Israel is a revival of the Israel they read about in their Bibles," he says. "But when you build a bridge from biblical Israel to modern Israel, there is an enormous gap in history and theology." Those conservative evangelicals who flock to Israel every year and express solidarity there with the Israeli government, he says, "may not understand that the modern state of Israel isn't anything like biblical Israel." As tensions between the Arab and Jewish populations in Israel as well as the surrounding territories have grown in recent years, so has the disagreement between those Arab Christians who are critical of the Israeli government and those U.S. evangelicals who hold pro-Israeli views. "I'd question the authenticity of their faith," said Cardoza-Moore, referring to the Christians in Jerusalem who oppose its recognition as Israel's "eternal" capital. "I'd say they're making a decision on a political expediency basis, not a biblical basis," she said. Burge, an ordained Presbyterian minister and a professor emeritus at Wheaton College in Illinois, an evangelical Christian institution, counters that it is those Christians and Jews citing the Bible to support their policy positions who are thinking politically. "We have a political application of a biblical idea," Burge says. "If you reach into the Old Testament and say, 'God has given the Holy Land to the descendants of Abraham,' that's fine. The question is whether the modern state of Israel is that nation that was imagined back in the Bible."